A massive congratulations to all of you who were involved in organizing this incredible event. We had a completely full house including honored guest Cathy Smith from Pinelands High School and Daniele and Jemma the interactors. Did you know that Alan and Margie Davidson's granddaughter is the deputy head girl of that fine school? Well done to Bev and Tanya for coordinating the invites and for Chris for juggling the ever changing numbers with the right amount of meals. Chris and the Helen Keller caterer's provided a magnificent meal including special request meals. The Anne's as per normal had transformed the dining room with yellow pin cushion proteas, chocolates, immaculate table clothes, and even a background power point showing what we have done over the years. Tanya's specially designed program and menu is a collector's item. Between Lihle's donation of wine and Mike H's well stocked bar there was no need to go thirsty. Frank struck just the right note as Master of Ceremonies and his introduction to our guest speaker Vice Chancellor Max Price was sheer genius. He focused on Max's saxaphone and running interests and did not even mention Max's extraordinary resume. Max loved it as it provided just the right ambiance. Our beloved President Tammy awarded a citation to Cathy Smith for her devotion to Interact and then our three founder members, Alan, Brian, and Chris (Henceforth known as ABC) were honoured for their services over 25 years. 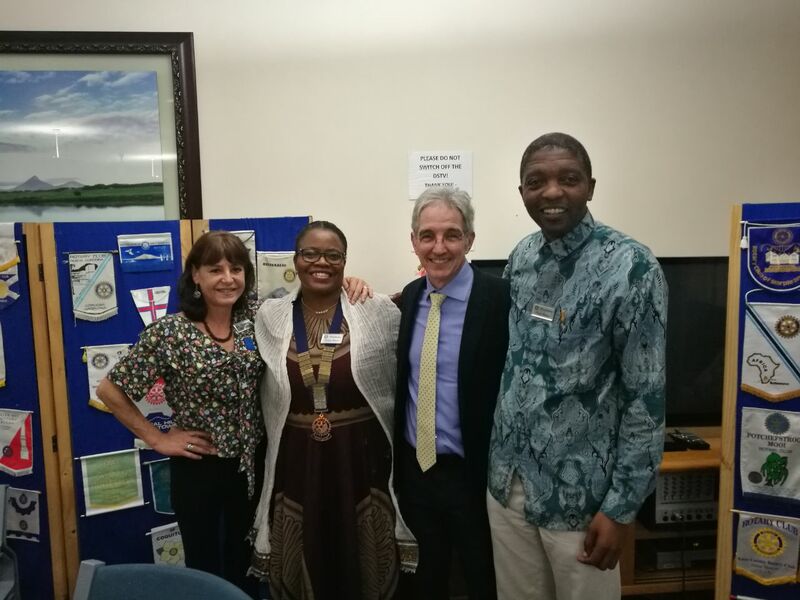 Maggie, through her UCT contacts, had managed to get Max to come and speak to us - the first time he has ever spoken at a Rotary Club! Between her and Tammy they had organized a lovely bottle of something as his speaker gift. I was privileged to sit near Max and before he even spoke to us I knew we were going to be blessed to hear him. He really listens to what one has to say and was fascinated (he gave that impression) to hear about Rotary. In particular he spoke at length to Freda about Rotary youth exchange. You could see him asking the right questions and listening to the answers. He engaged with us all, but on a one to one basis. It was a rare privilege watching him soak up information and gain understanding about our club, the region, and Rotary International. Tammy's son mentioned he had found writing in the new tented exam center at UCT difficult. Max really listened to his experience and then told us that they ordered 50 000 ear plugs to block off the noise of the tents blowing in the wind and the M3 freeway traffic. Max's speech must have been how Aristotle taught. He gave us a number of fascinating case studies of ethical dilemmas he has faced in his ten years as Vice Chancellor. He presented one case study at a time, and then asked us what we think he should have done. With each answer he would carefully check understanding and then point out another possibility we may not have considered. It was a talk like no other we have experienced, and there was not a person in the room who must have had to have a paradigm shift on some dearly held opinion. At the end of each discussion he would say what he had done and why. It is fair to say that it was an extraordinary evening filled with old friends, great memories, awards, wonderful food, and an interactive Aristotle-like talk. I think all Pineland Rotarians both past and present must have been very proud last night. I certainly was. Here's to the next twenty five years!